Starting at the car park on the Nick-of-Pendle, join in with this guided walk on Pendle Hill which will include local and interesting facts about the geology and archaeology of the area. Experts will tell you all about these historic secrets which our favourite local hill usually likes to keep to herself. The walk takes a pre-planned route, however may deviate from the path if something interesting catches the eye. Dogs on a lead welcome. Take a packed lunch. Booking essential - 01200 448000. There’s lots to see and do in Halton, near Lancaster, over the weekend. 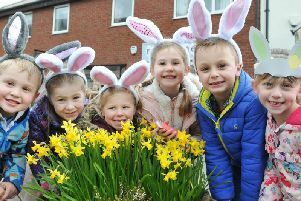 The main focus is a garden safari where a number of local residents will open their gardens to visitors, and there’s also a craft fair, coffee morning and tower tours at St Wilfred’s Church. For full details see www.haltoncentre.org/2017/03/summer-weekend-fun-activity/ or for queries about the Safari contact 01524 811684. Other groups are encouraged to organise their own activities to make this a wonderful village weekend. The Beaverbrooks Bike Ride is a family friendly event that runs annually across Blackpool, Wyre and Fylde and is a great a great opportunity to dust off those cobwebs and get your biking gear on. Whether you’re a beginner or a little bit more adventurous the bike ride is suitable for all abilities. Choose, from 15, 18, 30 or 45 miles at one of the two start points. A great day out and all for a great cause. Starts at 8.30am.Tickets are £12 adults; £6 children, available from 01253 359387. Meet at Fairhaven Lake South car park. Chorley Little Theatre welcomes everyone for a night full of joy and laughter. An MC and three top comedians hand-picked by Jason Manford will make for a great night of stand-up comedy. ​The show starts at 8pm and finishes at 10.30pm. Tickets are £12.50. Chorley Little Theatre is on Dole Lane. For more information visit www.chorleylittletheatre.com/chorleytheatre/ or call 01257 264362. Please note: Jason Manford is not part of the line-up. Inspired by the ancient Greek legend of Orpheus and Eurydice, Depart will take you on a path through the vast spaces, iconic features and intimate wooded areas of Stanley Park, transforming one of Blackpool’s most beautiful public spaces into the underworld. Taking over the park for just four days, circus artists will dance above your head, surprising you with extraordinary feats of physicality as they guide you through the space between life and death in this astonishing visual feast. This performance is suitable for ages 11 and over. Tickets start at £10 and are available from 01253 290190. Performance start at 9.15pm. Grab the girls (or guys) and have a night out at the movies. Enjoy all your favourite songs from movies like Dirty Dancing, Grease, Fame, Footloose and Flashdance, plus the best of the rest. All performed live by some talented female and male vocalists. This night is perfectly complemented by a four course choice dinner and dancing till the early hours. It’s at the Park Hall Hotel, Charnock Richard, near Chorley from 7pm. Tickets are £29.95. Call 01257 581524 or visit www.lavenderhotels.co.uk/ to book. With ever-changing scenery on your doorstep, you will experience a unique, tranquil and enjoyable time on this narrow boat lunch cruise. Located on the Liverpool-Leeds Canal, it is run by Canal Boat Cruises. Lunch cruises take approximately three hours.Tickets are £39 for adults; £19.50 for ages eight to 14; £12.50 for ages three to eight, with under threes free. Cruises start at 12pm. To book visit www.canalboatcruises.co.uk/ or call 01254202967. This event guarantees a family fun day with something of interest for everyone. At 1pm there’s a war re-enactment in the grounds of St James church grounds when the Americans take on the Germans. There will be more than 75 stalls offering foods from all over the world. It runs from 10am until 4pm, throughout the town centre. Let your teddy bear enjoy a day out with you at a special picnic held in Morecambe’s Happy Mount Park. Service Day is the theme of this teddy bear’s picnic, so watch your teddy bear parachuting from on high, with fire engines, the Air Ambulance Service and the police too. There’s plenty of other things for teddy and you to do, with teddy bear competitions, including best dressed teddy as well as workshops with children’s entertainers, Abracadabra. It’s all being held in aid of Cystic Fibrosis from 11am. For further information call the Cafe in the Park on 01524 401140. Calling all mini explorers and their accompanying adults! Head over to the RSPB Ribble Discovery Centre at Fairhaven Lake in Lytham for a fun filled session for under fives with a story, wildlife wow moment, snack and drink. So whatever the weather take your wellies and explore the amazing outdoors. It’s on Monday, June 5 from 10.30am until 12pm. Child admission is £3 for members or £4 for non-members. For more information call 01253 796292. This is one of the regular walks from Garstang. Each walk will follow a different route (conditions permitting) taking advantage of seasonal changes. This walk is graded moderate which means it may feature uneven ground, with some moderate slopes. Meet at Visit Garstang Centre for a 10.30am start. Tickets: £3.50, concessions at £2.50.